Need a warm drink to serve to family and friends this season? Our gated community has this annual tradition where one night in December there will be some porches throughout the neighborhood that hand out holiday beverages and snacks. Everyone walks around visiting and admiring each others Christmas displays. The snacks on each porch are different. Some have eggnog and treats, some have cocoa and gingerbread. Santa photo ops, candy, and cookies are yet on another porch, and my porch is now famous for my mulled hot apple cider. People come back year after year saying how they've been looking forward to my cider, so that makes it a sure-fire winner in my book. We also love to make it for Thanksgiving and Christmas when the family is together. Start with one 96oz container of apple juice and pour it into your pot. You want to fill it up about 1 1/2 inches from the top. Depending on the size of your pot you can add more juice from your second container. I keep the extra juice on hand to refill the cider and also to cool down any kid's cups. Next you want to cut off a section of cheesecloth about 12 inches long. Cheese cloth can be found in the baking and sometimes cookware sections of most stores. I have also found it randomly hanging in aisles as a bonus display item throughout the store, so keep your eyes peeled. If I find some I stock up and grab a few because when it comes time and I actually need them, they are no where to be found. Get your 12 inches of cheesecloth wet, wring it out, and lay it on the counter. Cheese cloth. See-through mesh that lets you add flavor without chunks in your food! Next, take four medium cinnamon sticks and break them in half and lay them in the middle of the cheesecloth. Add exactly thirteen whole allspice berries. Not twelve, not fourteen. Thirteen. I don't know why this exact number is true, but I have added more one time on a whim and the cider takes on a weird strong spice taste, so thirteen is the magical number. 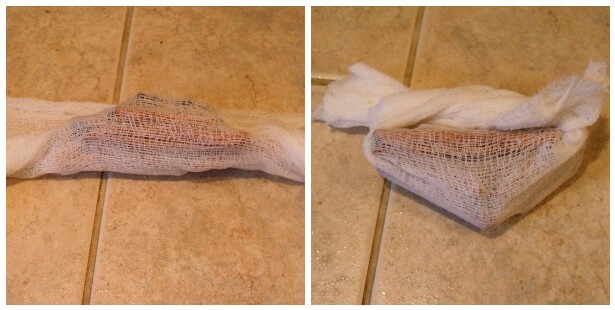 Next you want to roll up your spices in the cheesecloth. Try to seal them into the center of the cloth. Then tie up the long sides in a simple X knot. Place this spice packet into the apple juice in the pot. Do this for both oranges. Now as you put each slice in the pot, squeeze out some of the orange juice and try to throw the slices in clove side down. They will roll around no matter what you do, so don't worry about it too much. Once all the oranges are in (and your spice pack is totally submerged underneath them in the liquid) turn on your burner to medium low and keep an eye on it. It's okay to bring it to almost a boil then back it off to medium low. If you have a crock pot, set it on low. You don't want this to boil, or even simmer, but to just get warm and toasty for at least three hours as the spices start to spread througout. Feel free to stir from time to time. After about 3 hours of mulling, your house will smell fabulous and your cider is ready to serve. Like I said, as people start to scoop out mugs you can slowly add more juice in. I keep the pot on "low" for the whole party. If it's too hot for kids, cool it off with some extra apple juice. After the party you can save the left overs in a pitcher in the fridge and heat it up for single servings the next day in the microwave. Toss the used bag of cheesecloth with the spices away, but here's a tip: Save the left over orange wedges and put them in your garbage disposal to make it smell nice. 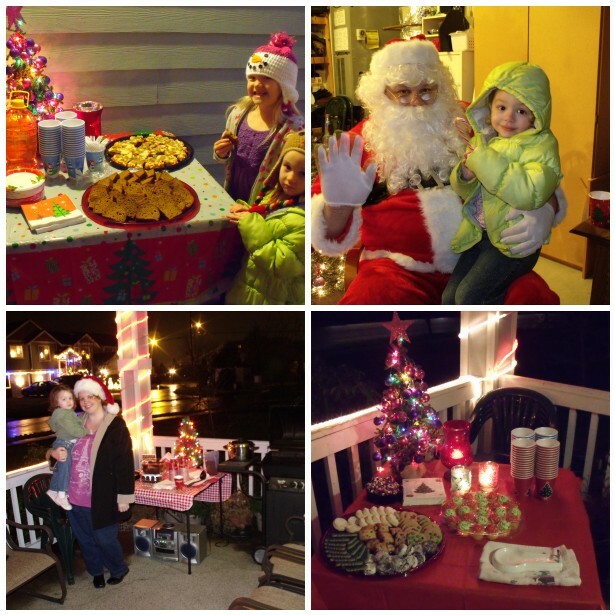 Here are some shots by the way of the last four years of our porch during the neighborhood "Holiday Happenings". We would have Christmas music playing on the radio, and I would keep the mulled cider warm on the side burner of the BBQ. People would come and visit for a few and move on to the next house. It was a great way to meet new people in the neighborhood too. All in all it has been a a very nice holiday tradition. Enjoy the cider! Full printable recipe found here. Ice Cream - as Gifts!